Ida Toivonen of Carleton University in Ottawa will teach the Introduction to Syntax course at the Institute. The course is set to cover a number of foundational syntactic phenomena and focus on basic argumentation that should be applicable across theoretical frameworks. In this interview, we get a glimpse of Professor Toivonen’s current research, among many other interesting facts, including being a police officer or a coffee shop owner in an alternate universe. Before university, I studied several languages. As an undergraduate, I studied linguistics and French literature at Brandeis University. After that, I went to Stanford for graduate school in linguistics. 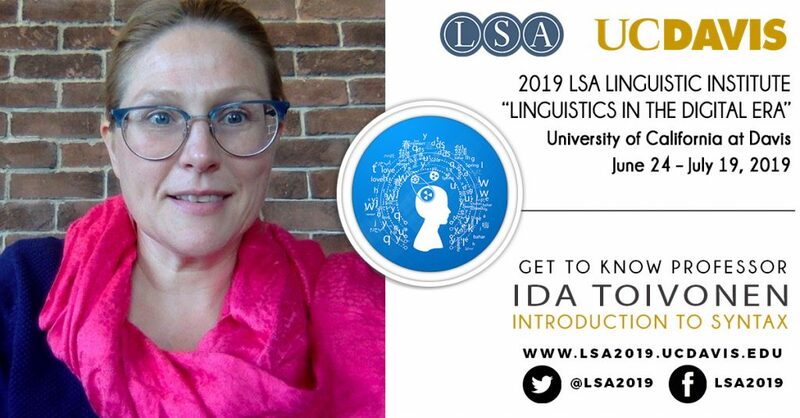 I have worked at the University of Rochester, the University of Canterbury, and I am now cross-appointed between the Institute of Cognitive Science and the School of Linguistics and Language Studies at Carleton University in Ottawa. I will be teaching Introduction to Syntax, and I am really looking forward to it. The goal will be to go through a number of foundational syntactic phenomena and talk about what makes them interesting. We will focus on basic argumentation that should be applicable across theoretical frameworks. My hope is that I will be able to show the students how exciting syntax is. I am working on the argument-adjunct distinction, distributivity, pronoun incorporation, evidentiality, and the phonetics and phonology of quantity. Running, watching movies and TV shows, and cooking. A police officer. Or I would be running a small coffee shop. I am looking forward to going to talks and workshops, and to chatting with people about their work. I am also looking forward to teaching my class. Ice cream *and* cake, cats, semester system. If you can, go to the LSA Institute! Also, keep an open mind and learn about different career paths. Talk to people who have various kinds of linguistics jobs.